Update: Sadly Budding Cafe closed sometime in early 2012. Location: Bridge Mills Building, beside O'Brien's Bridge, Bridge St, Galway City. This Italian / vegetarian café was established as part of Heneghans's Florist in Sea Rd in 2004. 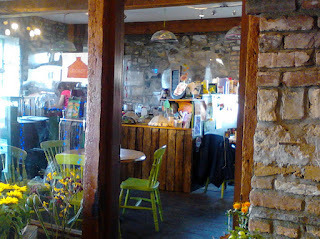 A second cafe was opened in the Bridge Mills in 2009, and this is where they are based today. This is very much a working florist shop as a well as cafe, making for an interesting combination of aromas. The café is boutique-style with about eight tables. It has a laid-back artistic feel, and serves a generous cup of coffee, and a range of teas.